So, I got caught a little bit off guard. I thought seasons always began on the 21st — but no, apparently not. Mia insisted spring was going to start today (the all-knowing preschool had told her so), but I said no, tomorrow. But then my own knowledge authority, the all-knowing NPR confirmed that today was indeed the first day of spring. 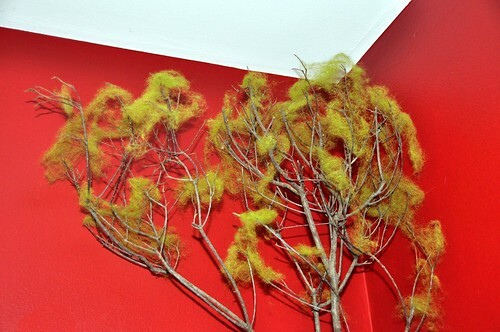 Had I gathered flowering tree branches for our spring tree? No. 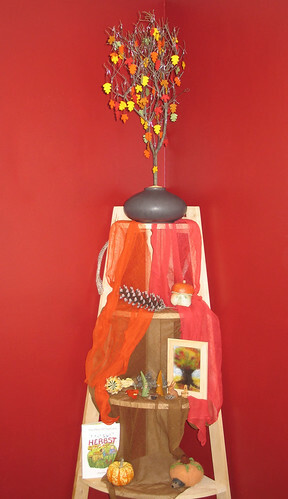 Had I made any spring nature table crafts? No. Had I scrounged together spring-themed books for the nature table? No. And worst of all, I hadn’t finished their little spring gifts. Little in size, not in time commitment. It’s the fault of those little gifts that I’ve been so absent lately because they are taking a lot longer to make than I thought. I imagine it also has a little something to do with kids staying up later due to daylight savings time (what about mama’s crafting time? ), and the fact that we have a few other little projects we’re working on right now (Tony’s tearing up the old, peel-n-stick vinyl tile out of the front hall at this very moment)… but whatever the exact cause, I’m not finished, though very, very, close! So, instead of scavenging the neighborhood for flowering trees, I bought some peach branches and pussywillows for our table. 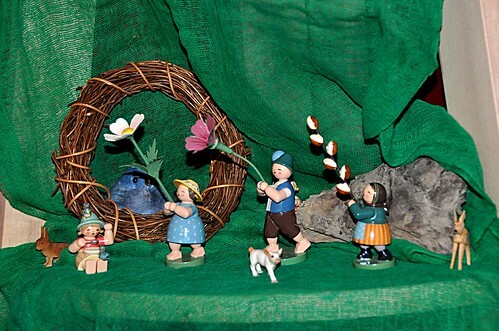 And instead of covering the nature table in spring crafts, I had to pull out some of my childhood German flower children figurines (they are so very beautiful, I’m glad I was reminded of them out of desperation). A little green roving in the tree branches to replace the white (some tears from Mia that it wasn’t pink roving), parts of the winter nature table that could be used for spring as well, some green mummy cloth to replace the white, and voilà, the beginnings of a spring nature table. I plan to add some craftiness to it as spring progresses and once I finally finish these not-at-all-spring-themed spring gifts for the littles! I’ll be back here more regularly now! Our winter nature table is a little barren compared to our autumn one, but I guess that, too, is a reflection of the season. Mia, my four-year-old, helped me spread the wool snow through the branches of our little tree before excitedly calling her Dada down to see it. That night, before going to bed, she told him spreading the snow in the branches had been her favorite part of the day, a gentle reminder how valuable the little things can be. Below the tree, there is a beautiful crystal candle Michelle gave us years ago, along with a little branch of holly. 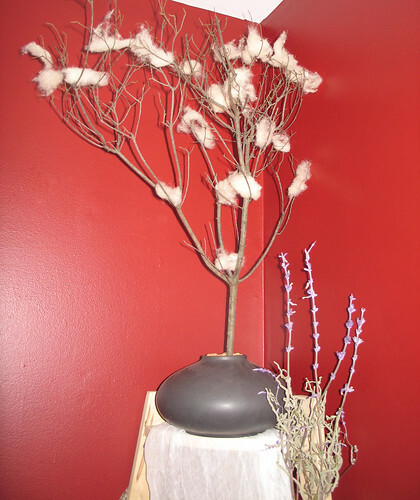 Although it’s out of season, I kept the salvia I dried last summer in a small vase; the muted gray-green and purple seemed to fit winter better than the other seasons. On the next shelf, Mother Nature should be wearing a dark brown cloak for winter, but the cloak and the other root child must be hiding somewhere in the playroom. 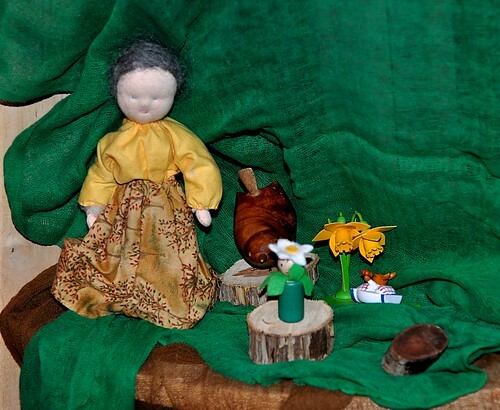 I made the Mother Nature doll from a pattern out of this wonderful book , and the root children were adapted from a pattern in that book as well. 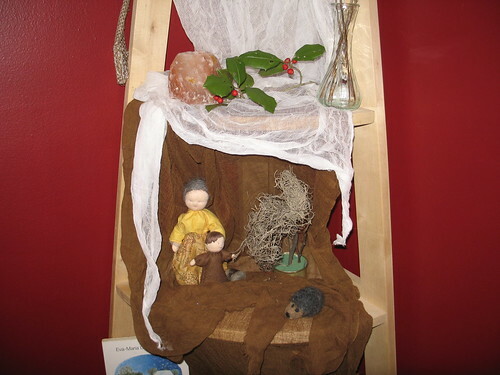 From the fall nature table, I kept the little felted hedgehog we picked up at a Waldorf school fair and the little sphagnum moss tree Mia made at the botanical gardens. 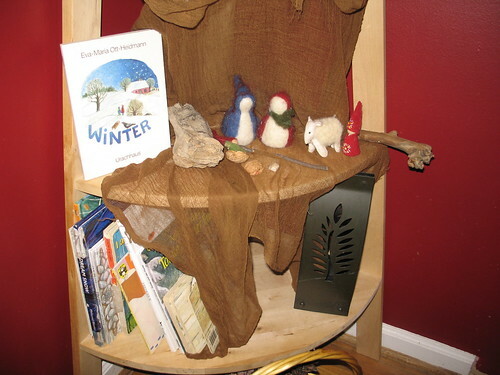 Little felted gnomes, also from the Waldorf school, inhabit the next shelf, along with a sheep I made and the Winter book in our beloved, beautifully-illustrated seasons series by Eva-Maria Ott-Heidmann. The bottom shelf has an assortment of winter books. Mia loves books, and we have quite the collection, but she was overjoyed to find the winter ones on display. She spent the afternoon bringing me one after another to read to her. Unlike Mia, for whom a book would stop a full-blown crying fit when she was as little as two months old, Lucas hasn’t shown nearly as much interest in books. So it was to my delight that he brought me The Mitten and had me read it twice in a row. At 18 months, he’s still not really saying anything, but he sneezed along with the bear and then cackled, pleased with himself. I’ll post a little bit about our winter books in the next day or so. Some of them are beautiful classics from my childhood, others are just sweet stories to share on a cold afternoon like today! We’re planning a trip to the library this week, so if anyone has any wintry recommendations, we’d love to hear them! If you haven’t been over to Big Sister Handmade today, Michelle has some great new posts up! I had better get to work on that countdown calendar! Thanks for visiting! I first read about nature tables when my daughter was just a baby. I fell in love with the concept of a beautiful little spot indoors that reflected the changing of the seasons and I always had the best intentions of creating one for our family. As each season arrived I’d find myself unprepared, until finally last summer, as my daughter turned four, I decided to craft a season ahead. I stalked craigslist until I found the perfect corner shelf, whose lower shelves even the baby could reach, but whose upper shelves would be safe from little fingers. I pushed aside my guilt over not having a spot for beautiful seashells and other summer treasures, and instead focused on fall. 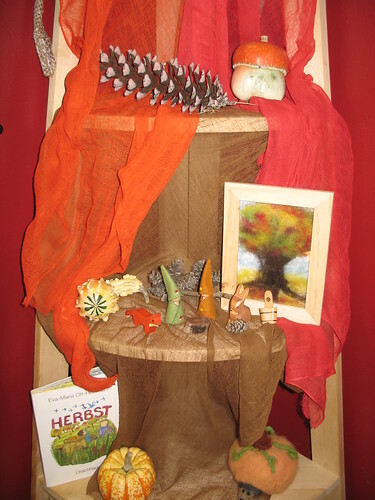 We have so very much enjoyed our nature table over the last few months. It’s in the corner of our dining room and often the subject of much attention during the day. Preschool fall art projects surrounded it, and it amassed quite a collection of pinecones under it from the tree in our front yard. Winter’s arrival, during the busy holiday season, left me once again unprepared, with little to put on a winter nature table. 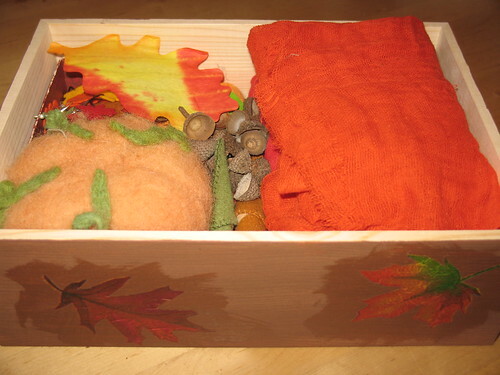 Luckily, a bleak nature table is not an entirely inaccurate reflection of the season, so I was just left with the task of putting away our little autumn treasures until next year. I took an unfinished wooden box and painted the bottom brown. 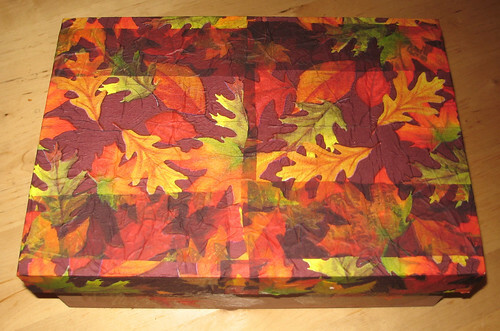 I mixed up my own decoupage mixture with glue and just a little water and used some fall leaf napkins to decorate the top and sides of the box. It didn’t turn out quite as I had intended. I should have either been more careful, by making sure the napkin pieces met to create whole leaves, or less careful, by having random bits at odd angles. The flash of the camera highlighted the glue around the leaves on the sides of the box, but that’s not nearly as noticeable as it appears in the picture. In any case, it will do to house our little treasures until next fall. We have a couple more little things to add to our winter nature table, but I should be able to share some pictures of it in the next day or two. And then in February, I’ll start the spring nature table crafting! Bleak won’t cut it for spring!